Since I’ve been asked a few times about dog friendly places, I figured I’d write up some recommendations. Houston has a bad rap of not being very dog friendly. While it’s true that the city makes it pretty difficult to have a permit (from what I’ve heard), there are actually a lot of places that allow dogs, even if it’s only on one specific part of the patio. Dan and I are very clearly obsessed with our pup, Barley, and tend to take him everywhere. I’m pretty sure all the Lowe’s employees know him by now. So if a place is a dog-friendly, you better believe we will hit it up more often. Cottonwood– Voted the best patio bar (at least I heard that somewhere? ), it delivers. The design is super cool, and while the food is mostly meh (seriously, I’ve tried everything on the menu- Sloppy JoJo is the only excellent thing), this one is a 5 minute walk from our house. AKA, it’s our most frequented spot. The beers on tap are constantly rotating and I love their Too Fresh cocktail. [Dogs only allowed on gravel] TIP: If you’re in the area, and want really tasty food, you should hop over to Shepherd Park Draught House, which is also dog friendly. West Alabama Ice House– This place is just a Houston establishment. It’s been around since the 1920’s and is absolutely no frills. Don’t visit looking for AC, but do visit for the ice cold, cheap beers and laid back vibe. Or if you like to shoot some hoops while drinking said beers. Even fun when your husband crushes you at a game of HORSE, while playing left handed. When he’s right handed. They don’t serve food, but there’s typically a food truck! Giacomo’s Cibo e Vino– Located in River Oaks, this place is a big favorite within the neighborhood. Fantastic Italian food, with a great wine selection, and a patio that somehow makes you feel like you aren’t sitting right on Westheimer. On top of that, service is great too. It’s nice without being frou-frou or overpriced, which I really appreciate in a restaurant inside the loop. Zelko Bistro– Everything I’ve eaten here is spot on- especially the mussels. The patio isn’t very large and is covered by a white tent that makes it feel intimate, but also like you’re at a wedding. There are also fresh flowers are on each table (when I’ve gone), which I always find charming. Put this at the top of your brunch list too- the sandwiches are all stellar. Gratifi– Set in a cute old house, in the middle of Montrose, this one is a winner. Full disclosure- I called this “Graffiti” for over a year, before realizing it’s actually pronounced like “Gratify”. I recommended it to several people this way, and am now embarrassed. This one has a wonderful brunch as well… leading me to branch out on this top. Empire Café– Super solid, true, breakfast items at an amazing price. Love this place. And so do other Houstonians based on the line that runs out the door every weekend! TIP: If it’s too crazy and you don’t feel like waiting, walk across the street to Brasil. It’s another yummy order at the counter place, with a big hidden patio in the back. Good luck finding the gate. Backstreet Café– Adore this place so much. While I haven’t sucked it up and paid dinner prices yet, Dan and I have enjoyed an absolutely delightful brunch here and I would love to go back (DAN!). They even brought out tiny baked goods with our meal. Someone get me a Backstreet Benedict, STAT. Bar Boheme– HUGE outdoor space. Actually, this place is mostly outdoor space. Go for the relaxed vibe, later than normal HH (4-8), and diverse drink options that still has all the classics. And if they have the frozen mojito, get that. And I know I said “just drinks” but do yourself a favor and order the Vietnamese fries too. Axelrad– Newer to Houston, this one is quickly becoming popular. Great local beer selection and they have hammocks, which is novel. Maybe not the best idea when people are drinking, as we witnessed! But amusing to watch people fall out J They also have a couple food trucks on site. Karbach Brewing Company– Probably our favorite Houston brewery. It’s closest to our house and they just do a really solid job with all of their beers. It’s been really fun to see them grow but also crazy how much they’ve expanded since we’ve lived in Houston! The actual restaurant patio isn’t dog friendly, which is weird, but the brewery area is and they usually have food trucks! Or you can order food at the bar in the restaurant and bring it out. Eight Row Flint– Another newer place people are flocking to! Driving down Yale, it’s hard to resist the call of this patio. It always seems to be bustling, and for good reason. Although the whiskey selection is what they’re known for, the frozen margaritas are some of the best I’ve had. Another perk- they cook all the food out of a truck, but there are actual servers, so no waiting in line! And the chips are to die for. Cheers to all my pup loving Houstonians! Oh New York City. Gets me every time. Especially when it keeps on serving up some awesome weather every time we visit. Such a game changer in travel. (See our last trip to NYC here and here). Once again, it’s embarrassing how much we ate. But what can I say. My list of places I want to try in NYC is WAY too long to stick with just the standard breakfast, lunch, and dinner. After stuffing myself full of bagel, we walked the High Line down to The Whitney, which is now in its new location in the Meatpacking District. It’s not a huge collection, so I figured it’d be a good one to hit with Dan ☺ I loved seeing Pollock, Calder, and Jasper Johns pieces, but the best was Calder’s circus, made to entertain his friends in Paris. The wires allowed him to move the pieces to put on a performance. I also loved the 5th floor exhibit, which rotates. When we first walked in, we saw a giant room with floor to ceiling windows on each end. The walls were blank. The exhibit was the sounds being played in the room- recordings from the artist from Sing Sing, a prison in NY. For lunch, we headed over to The Lobster Place at Chelsea Market and split a whole lobster, dunked in lots of butter. YES. We also stumbled on a sample sale for Faherty Brand and got Dan a bunch of tee’s for only $10 each! Such a steal. Next up, I had some beer bars in mind for Dan. First stop- The Standard Biergarten. It’s under the highline and has an authentic German beer hall feel, but amped up with a trendy factor. I was surprised at how few beers were on tap- just 4 and of course, all German. The ping pong tables were also fun. Then afterwards, Blind Tiger, which had a ton of New York beers on tap that we’d never tried. Oh and full disclosure, we stopped for Magnolia Bakery’s famous banana pudding in between (although, if I’m being honest, I’ve had better at various BBQ establishments throughout the TX hill country). We enjoyed a walk around the Village in the golden hour light, before stopping at Babu Ji for an appetizer. It was divine and has me seriously craving Indian food. Anyone have any Houston suggestions?? The Gol Gappa straight up melts in your mouth and is bursting with flavor. Then it was on to Raclette (BYOB!) for dinner to experience cheesy goodness poured over our meats & veggies. The place was TINY, and only seats 12 people! Only in NYC. 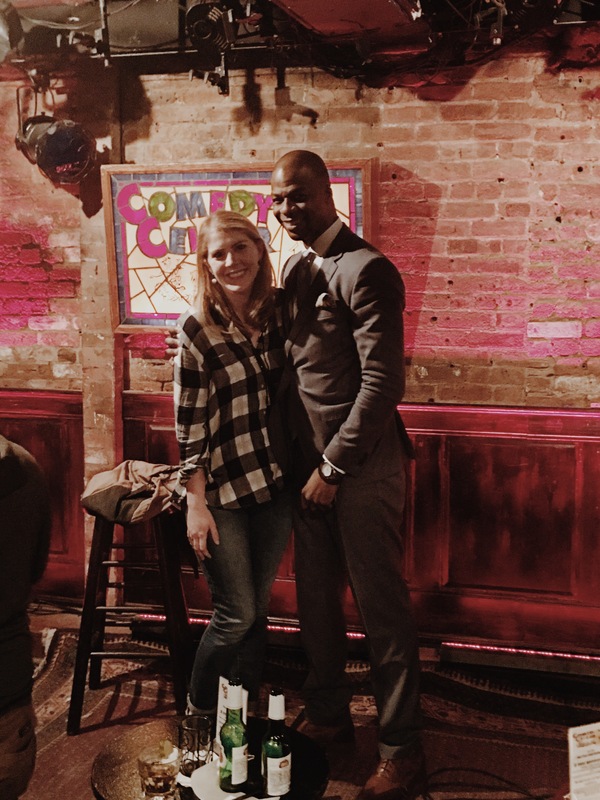 That night, we went to a show at the Comedy Cellar and I don’t know if I’ve ever laughed harder in my life. Some seriously talented comedians! Getting to sit right up front was a nice treat and one of the comedians told me afterwards that I had a nice laugh. Which was an insanely nice compliment to receive and I’m trying to not let go to my head 😉 After dinner, we stopped in at Little Branch, an underground speakeasy with more good cocktails. We brunched at Bar Primi, which was number 1 on The Infatuation, but kind of underwhelming. Maybe because we were just about the only people there. I think I made the (unnecessary) reservation too early! Then we walked around SoHo, soaking in the weather, and ended up grabbing tacos at La Esquina that were phenomenal. I was a little hesitant to get tacos north of Texas, but it was worth it. That afternoon, I shopped around with a friend from college before meeting back up with Dan for drinks at Mother’s. We drank spiked slushies, which would sell like hot cakes in Houston during the summer time. We needed to grab show tickets at TKTS, but I was dreading heading up to Times Square, so we went down to South Street Seaport and scooped up some School of Rock tickets before heading to dinner at Il Brigante– legit Italian food. The ravioli was handmade and perfect and smothered in butter. I like butter, okay?? Afterwards, we raced up Broadway and barely made it on time to School of Rock, which was adorable- of course, all the performers were extremely gifted, but the end had me tearing up from the sweetness which was a big surprise. After dinner, we met back up with my friend at 205 Bar, which seemed very trendy. We definitely wouldn’t have gotten in without saying we were with a party. We were both still in jeans and t-shirts. Ha. Then we proceeded to stay out dancing until 4 AM and I don’t even know how that happened. But the DJ was amazing and had his audience nailed on the head- think N’Sync and Spice Girls mashed with current music. We clearly had a good time, even if it was the polar opposite of how we spend weekend nights (friends over for dinner, in bed by 12 at the latest). By the time we finally got up and headed to brunch, Russ & Daughters Café had a 2 hour wait. TWO. So ya, that wasn’t happening. We were too hungry (somehow?) to look much further and ended up next door at Black Tree, which hit the spot. Afterwards, Dan spotted a place tucked into the end of an alley. Luckily, I hadn’t had a Bloody Mary yet, so we were able to stop in 🙂 The decor was so perfect- if I ever owned a restaurant, I’d want it to look like this place (Freeman’s). Thanks for spotting it, Dan! And to be perfectly open, we did indeed stop at Prince’s for one last slice of pizza before heading to the airport (don’t worry, we shared). No shame. I love celebrating love. Dan is one of the types that thinks Valentine’s Day is stupid, but I’ve always loved it. What’s not to like about sweet, cheesy cards, chocolates, and flowers?! This year, Dan woke up early to pick me up a chocolate croissant (my favorite) from a local bakery/ dessert place- Red’s Dessert Dive. If you know how much Dan likes sleep, then you’ll understand how thoughtful of a gesture this was! He even had a sweet little poem for each piece of our day- even just going church. It was too sweet and I loved it. Our big event was a beer and cheese pairing at Saint Arnold’s Brewery! Houston Dairymaids provided the cheese and we learned about where it was from (all over Texas) and why it pairs well with beer. Supposedly, beer pairs better with cheese than wine!! Something to do with the bubbles in beer. I was too busy salivating over the cheese. We ended the night with more cheese in the form of Pink’s Pizza. It was a perfect, low-key, day. Feels very old school mod, from the cocktails to the furniture. The Mexicali Sour was so fresh and tasty, but the drink specials change regularly! From the people at Treadsack, AKA all the great and trendy restaurants in Houston. In a converted gas station, this patio is a dream. Apparently people agree because it was pretty packed. And the frozen margaritas are divine. I’ve been converted from an “on the rocks” girl- exception made only for this place. Check it out, and make sure to get some tortilla chips, because they are perfection. No wonder I like it, it’s the same people behind Coltivare! With an amazing selection of Belgian beers (my personal favorites) and all the Belgian delicacies you can imagine, this place was delicious. The mussels come out in a big hot pot (YUM) and I had to follow it up with Belgian waffles because I’m into clichés. Of course, the Belgian Frites were great too. But beware- service is SLOW. And my favorite restaurant this weekend… our own home. REALLY loving our kitchen. And the people who fill it. And the food that’s made in it. And I promise I’ll post more on the remodel soon…. in the mean time, this Thai Chicken braised in Coconut Milk was just great, even if the pictures weren’t as pretty! Oh the joy of being at home. Something that Dan and I never seem to get enough. There is just something too good about waking up sans alarm on a Saturday, in your own bed. Then proceeding to have a cup of coffee on your patio, in the cool January weather, while perusing articles online. And to sum up the best morning ever, hearing your husband call to you that breakfast is ready and going inside to the smell of bacon and Dawes playing over the speakers, as he whisks you around the living room for a quick waltz. Seriously. Such little things make for the greatest morning. Trying to savor every minute of this phase of life. Ignore the weeds covering the yard. Hanging out at some new Houston places, along with some old favorites (El Tiempo, always). Axelrad opened last month and is a very cool beer garden. I loved the simplicity of it, but the colors really amped it up. The tap handles were gorgeous and the beer selection was diverse. We also finally tried Reef, a seafood place in Midtown. Turns out the porkchop ended up being the best dish! Playing catch up! After weeks of not being home much, I cleaned up and cleaned out. So much went to Goodwill and the church. I feel like they are probably overwhelmed every January as people purge for the new year. I definitely felt the urge to purge, and I haven’t even read any Marie Kondo books 😉 Even our fridge got a refresh! This wasn’t even 1/2 of it. Finally, FRIENDS! Yay for friends (not the show, but yay for that too- we’ve been Netflix binging). Y’all rock. Houston has some fine people. My first Paula Dean recipe- and with no butter!! Shocking. This Apple Stuffed Pork Loin had so much flavor! I was intimidated at first, but it turned out to be very do-able. Make sure you have plenty of apple cider vinegar on hand. The meal I made twice comes from Martha Stewart- Sweet Potato Sausage Soup. The sweet Italian sausage really ups the ante (and is just about the cheapest meat I’ve ever bought). Perfect for colder months. I hear it’s going to be an especially chilly winter, so I’m expecting to make this even more. This BBQ Chicken Quinoa Casserole was super easy and really great for lunch leftovers! I was looking for easy dishes to feed a big group for our small group’s Christmas party and decided to on a couple baked pasta dishes. While the chicken ziti was just meh, this Baked Pasta with Spinach and Ricotta was super yummy. I’ve been having a bit of thing with ricotta lately. I seriously can’t get enough and want it on everything. I made this in advance, which meant no dirty dishes in the sink when everyone came over! And to finish it off, dessert! I “baked” this Dark Chocolate Salted Caramel Oreo Pie for the Christmas party dessert and OH MAN. Incredibly rich and just divine. As much as I love chocolate, I’m not a big baker, so this recipe was perfect as it didn’t even require the oven! In January, Dan & I will be back to mainly paleo eating, so I’ll be back to constant chopping of everything and putting approximately one million different spices in every dish.